Adults who walked briskly, were moderately active in their leisure time, drank moderately, didn’t smoke and avoided obesity had half the risk of heart failure as adults who did not optimize these modifiable risk factors, according to a study that followed nearly 4,500 adults for two decades. Heart failure, a condition where the heart fails to pump as much blood as the body needs, is increasing in frequency in the United States and is a leading cause of hospitalization for people over age 65. Researchers in this study, led by Liana C. Del Gobbo, Ph.D., from the Friedman School of Nutrition Science and Policy, Tufts University, followed 4,490 men and women age 65 and older who didn’t initially have signs of heart failure for up to 21. 5 years, tracking their diet, walking habits, leisure activity, exercise intensity, alcohol use, smoking status, weight, height, waist circumference and heart health through questionnaires and physical exams throughout the study period. During the study, 1,380 heart failure cases occurred. Researchers found that adults who walked at a pace 2 miles per hour or faster had a lower risk of developing heart failure. Participating in leisure activities that burned more than 845 or more calories a week, not smoking, modest alcohol intake of one drink or more a week (but not more than 1-2 drinks/day), and avoiding obesity were also associated with reduced rates of heart failure. Participants who optimized four or more of the healthy behaviors studied were half as likely to have heart failure as those with zero or one low-risk factors. Researchers also tracked four different dietary patterns, including the Dietary Approaches to Stop Hypertension or DASH diet, and a new diet score based on the American Heart Association’s 2020 Impact Goals, but found no relationship between dietary patterns studied and heart failure. 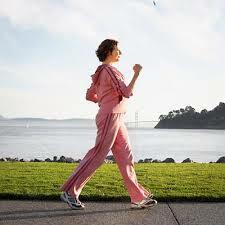 Exercise intensity was not as important as walking pace and leisure activity. “It’s encouraging to learn that older adults can make simple changes to reduce their heart failure risk, like engaging in moderate physical activity, not smoking and maintaining a healthy weight. Although dietary patterns were not related to heart failure risk in this study, eating a healthy diet is of critical importance for preventing other cardiovascular diseases, type 2 diabetes, and other chronic diseases” said lead author Liana Del Gobbo, PhD, research fellow at Tufts University. In the accompanying editorial, David J. Maron, M.D., and Sharon A. Hunt, M.D., noted that it is difficult to assess lifestyle interventions in randomized controlled trials, the gold standard for medical treatments, but this analysis provides evidence to support inexpensive lifestyle interventions.